You hear it all the time, the popular buzzword – content marketing. But, do you know what it means and – if you are currently doing it – are you even doing it right? For many small businesses online, lack of knowledge or skillset is what turns a good idea – a content strategy – into an ineffective way to grow their business. So, what exactly is content marketing and how do you use it for your business? Your customers are smart. Traditional marketing tactics just don’t work anymore, and businesses need to evolve to using a different approach. This is where content marketing enters the picture. It should be the first step in your marketing plan as a way to attract customers. It works by bringing awareness and education about your product or service to your audience. If your audience finds your content valuable, there is a good chance they will share it and continue going to your site. Content is such a strong marketing tactic that buyers use online content to help them during the buying process 67% of the time. But, many businesses aren’t really sure how to implement a strong strategy. They often think a blog is enough. Or, that tweeting their latest blog post is content marketing. For your strategy to be effective, you need to make sure you’re creating consistent and valuable content. Let’s look at three reasons why your current content marketing strategy may not be working for you – and what you can do to turn things around quickly. You decided to put your small business online, and the first thing you learned about is how businesses should have a blog. According to a HubSpot survey, 60% of businesses with a blog acquire more customers. Your business blog is the heart of your content marketing strategy, but when you start blogging, you realize it’s a lot harder than it sounds. Producing original and value-driven content can be hard for small businesses that either lack the time or skill to blog. One way to add more value without having to come up with in-depth blog posts is to repurpose your content. Up to 29% of marketers reuse and repurpose content as a strategic tactic in their marketing efforts. Content repurposing is the process of taking your older, but valuable pieces of content and converting it in into different formats for your audience. Since not everyone enjoys or has the time to read blog posts, this can be a great way to expand your brand reach and attract a new audience base. The content you put out on your blog will just sit there unless you promote it. While some marketers think simply producing content is “content marketing,” they are missing the whole marketing part of this equation. They think users will magically find their content, or that organic traffic will suddenly spike. But, this is unlikely, especially if you’re a new online business. To see your content marketing efforts make a difference, you need to start promoting your content. Let’s look at three ways you can promote your content online. Since up to 74% of users are on social media at any given time of the day, it’s safe to assume your target audience is on social media. Depending on where your target audience hangs out, you might find one social media platform a better fit for your brand than another. If your brand is more relatable visually, then using a visual platform like Instagram or Pinterest to promote your content can help boost your traffic. But, if your brand appeals to a younger group, Periscope might be your best bet to share content and engage with your audience. When promoting your content on social media – and especially Twitter – take advantage of hashtags and trending topics. For example, one buzz topic on social media was #BacktotheFutureDay on October the 21st of this 2015. As any fans of the movie would know, this date was the day Marty McFly and Doc travel to the future. Many brands participated in this trending topic with their own spin on BTTF day. 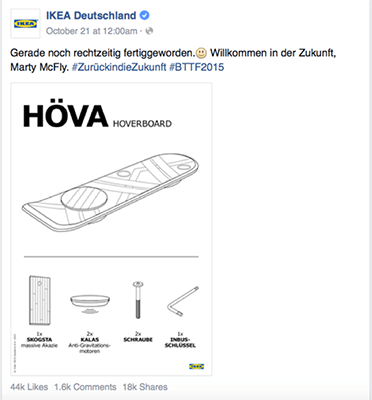 For example, IKEA posted assembly instructions for the Hoverboard (the pinnacle and famed icon of the future). Marketers today are using influencers and bloggers more than ever to help build brand awareness – and they make great allies. Audiences tend to trust influencers more since they are relatable and personable. After building a relationship with various influencers, you can now approach them via email or through a Twitter Direct Message. You might have a product you want them to review, or maybe you’re interested in featuring them in one of your blog posts. Enlisting the help of influencers can skyrocket your brand awareness and is something your content marketing strategy should definitely consider. The web is full of email templates for blogger outreach. But most templates are poorly written and will only damage your reputation. Read Adam’s post on blogger outreach to find out what to do instead. A great way to get backlinks and increase your long-term traffic is to respond to questions on Quora. People use Quora to ask questions or offer answers. So, how do you go about doing this? You can’t just hop on Quora and start dropping links. The best way is to set up a profile with a detailed summary and accurate bio. From there, you need to do a little digging to find popular questions in your industry and then start giving out your expert advice. 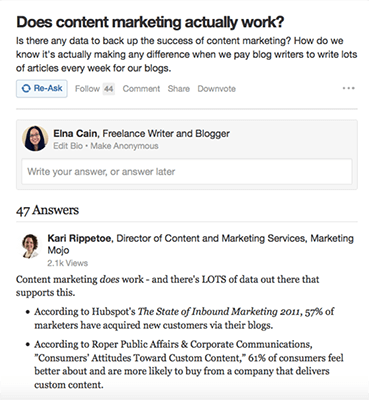 Traffic won’t appear overnight, but the time you devote to establishing your credibility in Quora will pay off in the end with targeted, long-term traffic. At the heart of content marketing is your actual content. If you have weak or poorly researched content, no amount of marketing will convince people to come to your blog. And if by chance you do get them to come, you can bet they’ll never return. So, you start a blog, and you have no idea what to blog about. What do you do? You follow everyone else and put up the same type of content as your competition. If people have seen it before, they aren’t going to read it. But, you’re probably wondering how can you write about something unique if it’s all been written about before? Even though there are hundreds of posts on content marketing tips, the top ones have unique qualities to them, making them valuable in the eyes of Google. How do you write about the same topic that everyone else is writing about? The easiest thing to do is to write it from a different angle. 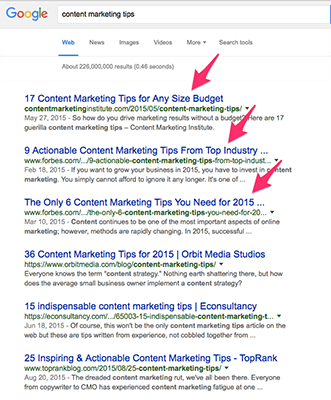 For example, the first result for content marketing tips was 17 Content Marketing Tips for Any Size Budget. You can spin that by adding more value and more tips – and by being more specific. You could target the post specifically towards solopreneurs or small businesses. Okay, this one might be a little tougher – especially if your industry isn’t really that popular or interesting. Maybe you run a retirement planning business, or your niche is mostly about accounting. How can you make your blog interesting so people want to read it and share it? You’ll want to provide educational and informative posts, and the best way to do this is to come up with a list of general story ideas that can apply to your business. Also, spending some time looking through bookmarking sites like Reddit and StumbleUpon can help you discover more ideas and topics that you know people like (because they are actively bookmarking them)! This one is all too common. You know what you like, but you have no clue what your target audience likes! Yikes! If you’re a new start-up, you might just rely on providing any type of content that’s interesting to you – or content that’s closely related to your product or service. If your business engages in email marketing – and you should – a quick way to assess what your audience craves is to look at your open rate. Since most companies email their subscribers the latest blog post, you can get an idea of what your audience really likes. 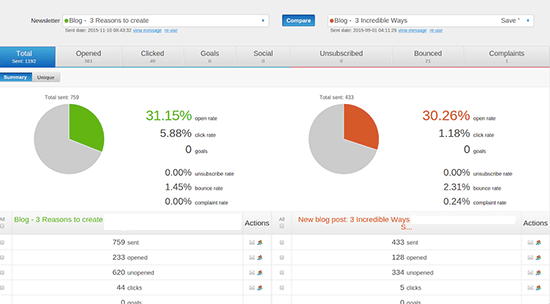 From here you can tailor your content to your subscribers. You can also look at your headline. It’s a fact that 8 out of 10 people don’t read past the headline. This means if you’re headline doesn’t make an impact, you’re missing out on a ton of traffic. Use numbers – List posts are the most shared type of post, according to CoSchedule. Leave an unanswered question – Avoid making a statement in your headlines. Instead, leave an unanswered question. Be specific – The more specific the better. If your headlines aren’t specific, readers won’t be able to decide whether your content is useful or interesting. Make a promise and deliver on it ­– No one likes to get hoodwinked. If your headline claims you have 6 proven strategies to increase your social media followers, then your post needs to back up that claim. Have you got a content calendar setup for your blog yet? No problem! Check out my post on why you need one and how to create one. 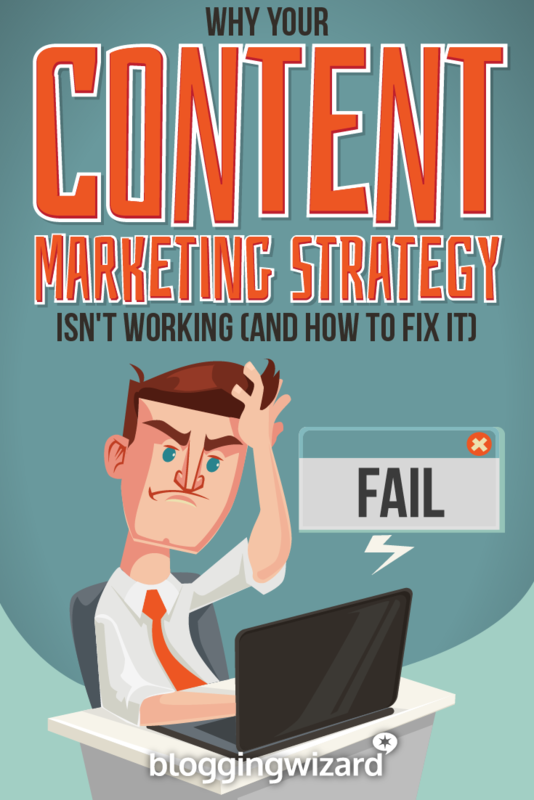 There are many reasons why a content marketing strategy doesn’t seem to be working very well. Sometimes just changing the format of your content from blog posts to podcasts can result in a noticeable jump in traffic. Other times, you need to focus on reaching as many people as possible by targeting several social media channels. But, one thing’s clear, if you don’t have valuable content that your audience craves, there’s no point in having a strategy at all. Deliver stellar content that educates and entertains. You will see increased engagement and traffic will soon follow.